Get familiarized with the best practices for implementing and managing an information security management system (ISMS) based on ISO/IEC 27001. The "PECB Certified ISO/IEC 27001 Foundation" exam is available in different languages. A certificate of "PECB Certified ISO/IEC 27001 Foundation" will be issued to participants who successfully passed the exam and comply with all the other requirements related to this credential. 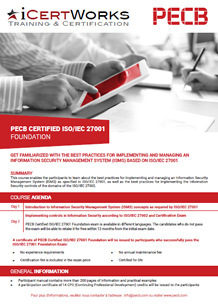 For more information about ISO/IEC 27001 certifications and the PECB certification process, refer to the section on ISO/IEC 27001 Foundation. There are currently no ISO 27001 Foundation courses on the calendar. Would you like a Foundation Training in your area? Contact us about ISO 27001 Foundation Training!